As a dealer For The People®, we believe we’re all created equal and everyone deserves a second chance regardless of their past credit history. Things are tough these days. We understand where you are and the challenges you are facing. Don’t go it alone; we can help. In fact, helping people with credit issues get approved for the car they want is what we do everyday. It’s what we specialize in. 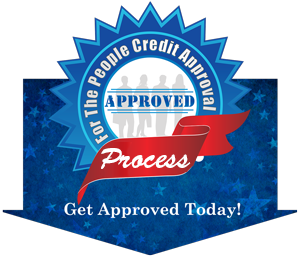 Our For The People® Credit Approval Process virtually guarantees you can be approved and driving home in a Nicer, Newer® vehicle regardless of credit problems you’ve had in the past. The process is easy, painless and starts right now. There’s no embarrassment or harassment, and we won’t sell your information to anyone. Fill out the form now — it takes just 30 seconds — and you may soon be approved and driving home in the nicer, newer vehicle you need and want.